One of the biggest challenges I faced was transitioning from academia into industry and understanding how the expectations between education and a large corporation differed. My current job is a newly created position so I had to learn what exactly I was supposed to be doing and how to fit into the company culture. The biggest challenge that I have faced so far in the industry is having to prove myself and show that I am capable of doing the work and accomplishing the task. I think this also stems from being a rookie on the job as well as being a woman in the industry. I believe that I was able to overcome this challenge by working hard, being prepared, and knowing who and when to ask questions. I have been working in the baking industry for 3 years. Last year, I had the opportunity to join my Lesaffre colleagues for an American Bakers Association (ABA) event where we lobbied on Capitol Hill. Not only did I have the chance to meet members of the U.S. Congress, but I also got to talk with current Presidents and CEO’s from some of the largest industrial bakeries. One of the changes that I would make to the baking industry would be to have more mentoring for the next generation joining the industry. The older generations have a great deal of knowledge and experience that I know the young talent entering the work force could definitely benefit from. 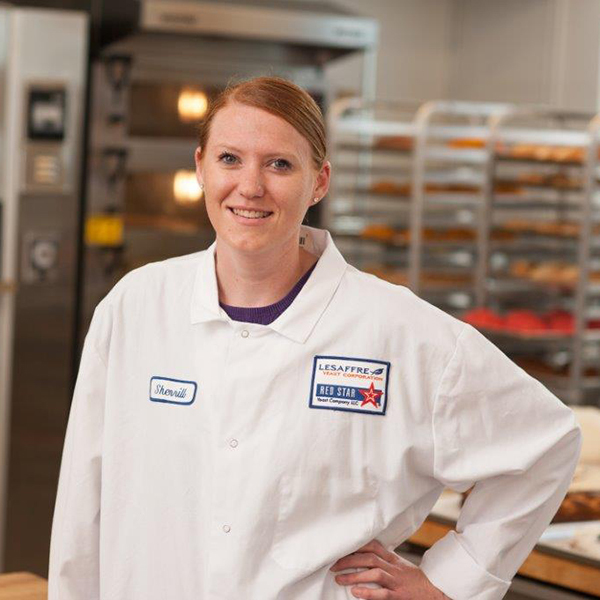 As the New Product Development Lab Manager for Lesaffre Yeast Corporation, I develop and conduct testing on new and current dough improvers for foodservice, small retail, and industrial wholesale bakeries. I also conduct testing on our varieties of yeast and I get to play with some really cool equipment used for testing and evaluating dough and bread. I would encourage students who are thinking about getting a degree in food or bakery science to complete as many internships as they can throughout their academic career. This will enable them to enhance their knowledge of the food industry and give them a better insight into their potential career path. For those individuals who are just starting out in the industry, find a mentor, find someone who they can ask questions and will show them the ropes of the business. They will be their best ally as they get started in their career. For my hobbies, I really like going for 6 to 8 mile walks, taking spinning class, reading, and traveling to visit my friends and former students that I taught during my time as a TA at KSU. This is a complicated question for me, as I have had many role models and teachers throughout my life who have helped me to get to where I am today. But from the standpoint of a role model in the baking industry, I would have to say that it would be Dave Krishock, former BNEF Bakery Science Instructor at KSU. He has been a great teacher, mentor, and friend to me and has helped to guide me during my time as a graduate student and as I have started my career. His passion for teaching and learning and his enthusiasm for baking is something that can’t be emulated. I hope one day I’ll be able to teach and mentor the next generation of young professionals coming into the food industry in the same caring way that he has shown me. If I could invite anyone, I would most likely invite Harriet Tubman to a dinner party. I would love to know how she found the courage and strength to journey back and forth to lead slaves to freedom through the Underground Railroad. If you could switch places with one other person, who would it be and why? I would probably switch places with one of the tour guides from Rick Steve’s European tours. I think it would be fun to get to travel all over Europe and get paid for it. My favorite bakery event would be attending the American Society of Baking (ASB). I really like this show because it’s held in Chicago, even though it’s cold, and because I get to catch up with a lot of friends and colleagues in the baking industry. If I could only eat one bakery product, it would probably be a toss-up between a true French croissant or toast. Don’t worry, you’ll figure it. My definition of success would be when I have finally achieved the goal that I had set for myself, no matter how large or small. What would you say has been your proudest moment in your career? Thus far, my proudest moment in my career was having an ingredient that took me almost two years to develop for an industrial bakery successfully work when tested during a production scale-up. I believe it’s still really early in my career for me to say I have had a “big break,” but I think one of the best decision that I made was leaving my first bakery job to pursue a Ph.D. This has helped me to narrow in on my passions and let me realize how much I enjoy working with and developing ingredients for the industry.